WASHINGTON – Sonia Sotomayor, her family and friends are gathering at the Supreme Court for her swearing-in as the court’s first Hispanic, third woman and 111th justice. Chief Justice John Roberts is to preside Saturday at two ceremonies that will officially make Sotomayor a high court justice. 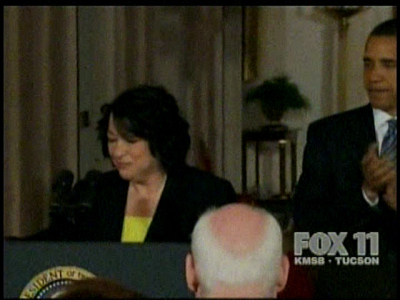 Sotomayor, 55, has been a federal judge for 17 years. President Barack Obama nominated her in May to take the place of Justice David Souter, who has retired. The Senate confirmed Sotomayor’s nomination Thursday by a 68-31 vote. Before she can begin her new job, though, she has to take two oaths. In a private ceremony in the justices’ conference room, Roberts will administer an oath that the Constitution requires of all federal officials, to “support and defend” the Constitution. Then, in a public ceremony that is expected to be aired live on some cable networks, he will give Sotomayor a second oath in which she pledges to “administer justice” fairly and impartially, as prescribed by a 220-year-old federal law. After that, the newest justice can get to work, although the court won’t hear arguments until Sept. 9, in a key campaign finance case. The entire court will convene a day earlier, however, for a formal ceremony to welcome Sotomayor. Many presidents have been on hand to see their nominees take their seat on the Supreme Court bench for the first time. President George W. Bush attended Roberts’ ceremony in October 2005.